REGRETFULLY, WE HAVE HAD TO CANCEL THE DECEMBER 18TH, 2015 SAMUEL BLASER QUARTET + DAVE GOULD CONCERT AT WAHC, DUE TO BUREAUCRATIC BARRIERS BEYOND OUR CONTROL. WE APOLOGIZE FOR ANY INCONVENIENCE AND HOPE TO WELCOME THESE ARTISTS BACK TO OUR STAGE IN THE COMING YEAR. THANK YOU FOR YOUR UNDERSTANDING AND SUPPORT! Swiss trombonist Samuel Blaser, known for blending progressive post-bop with early music, heads a tribute to the late, ever-stimulating jazz eccentric Jimmy Giuffre, with crack band which includes master-drummer Gerry Hemingway and versatile pianist/keyboardist Russ Lossing. New York based jazz pianist, composer and recording artist Russ Lossing is known worldwide for his highly personal and unique improvising voice. Lossing has composed over 400 works and has an international reputation as a world-class improviser. Lossing has twelve releases as leader on Hat Hut, Clean Feed, Fresh Sound, Double Time and OmniTone record labels. Lossing worked with Motian for over twelve years both as leader of his own trios and as sideman in the Paul Motian Quintet playing at the Village Vanguard in New York. Gerry Hemingway has been making a living as a composer and performer of solo and ensemble music since 1974. He has led a number of quartet & quintets since the mid 80’s including his current quintet with Ellery Eskelin, Oscar Noriega, Terrence McManus and Kermit Driscoll as well collaborative groups with Mark Helias & Ray Anderson (BassDrumBone) celebrating its 34th anniversary in 2011, w/Reggie Workman and Miya Masaoka on koto (Brew), Georg Graewe & Ernst Reijseger, recently celebrating its twentieth anniversary (GRH trio), WHO trio with Swiss pianist, Michel Wintsch and bassist, Baenz Oester, as well as numerous duo projects with Thomas Lehn, John Butcher, Ellery Eskelin, Marilyn Crispell, Terrence McManus and Jin Hi Kim. Mr. Hemingway is a Guggenheim fellow and has received numerous commissions for chamber and orchestral work including “Terrains”, a concerto for percussionist and orchestra commissioned by the Kansas City Symphony. He also been involved in songwriting documented in the CD “Songs” produced by Between the Lines as well as his collaboration with John Cale. He is well known for his eleven years in the Anthony Braxton Quartet and more recently his duo with Anthony “Old Dogs (2007)” released on Mode/Avant. His many collaborations with some of the world’s most outstanding improvisers and composers include Evan Parker, Cecil Taylor, Mark Dresser, Anthony Davis, George Lewis, Derek Bailey, Leo Smith, Oliver Lake, Kenny Wheeler, Frank Gratkowski, Michael Moore and many others. His rich musical history, collaborations, performances and recordings are all amply documented on his extensive website: http://www.gerryhemingway.com. He currently lives in Switzerland having joined the faculty of the Hochschule Luzern in 2009. Drummer, percussionist, string player, yarn ripper… is there anything Dave Gould can’t do well? Probably… but why not come and hear some of the things he is really good at? 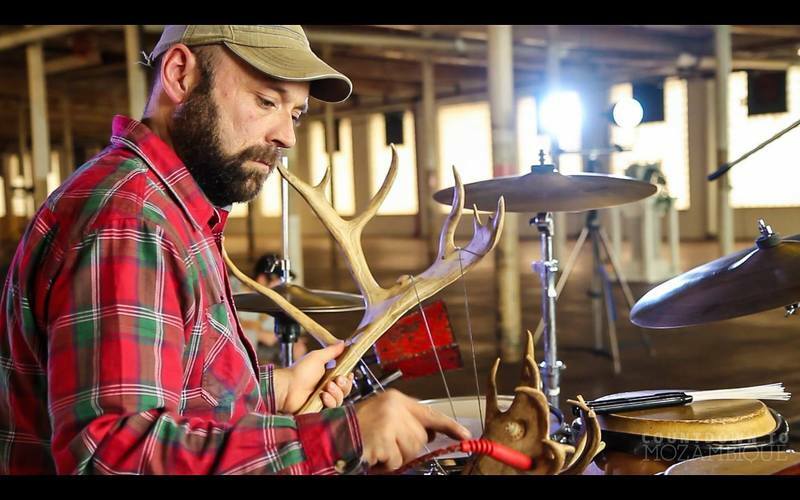 Dave plays beautifully on awe-inspiring instruments he has built from fund objects in nature, including antlers and whalebone. A real treat and truly worthwhile experience!